Olive Garden Tiramisu is a classic Italian dessert. Espresso, chocolate, and mascarpone cheese makes for a delightful and uplifting dessert. This dessert has been on the menu at the Olive Garden as long as I can remember. One of the best things about this dessert is that you actually should make it a day or so ahead of time, this way you aren’t rushed the day you have your friends and family over for that special meal! Cut across middle of sponge cake, forming two layers, each about 1 and 1/2 inches thick. Blend coffee and brandy. Sprinkle enough mixture over bottom half of cake to flavor it strongly. Don't moisten cake too much or it may collapse on serving. Beat room temperature cheese and 1 cup sugar until sugar is completely dissolved and cheese is light and spreadable. Test for sweetness during beating, adding more sugar if needed. On the cut surface of bottom layer, spread half of the cheese mixture. Replace second layer and top with remaining cheese mixture. Sprinkle top literally with sifted cocoa. Refrigerate cake for at least two hours before cutting and serving. You can find more Olive Garden Recipes at CopyKat.com, the web's most popular destination for copycat restaurant recipes. My fave in the entire universe! We really liked this recipe. Is it possible to make og flourfree and milkfree? I am sorry, I don’t think I can swap out both the flour, and dairy. I had a little trouble figuring out measurements because I used rum extract instead of alcohol; however, I think it turned out rather well for my first time. Thanks for the recipe. I will definitely be making it again! 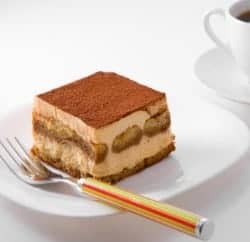 The tiramisu is definitely the favorite dessert of my husband and can not miss at his birthday. For my children instead I made a variation of the classic tiramisu to make it lighter and more palatable. I replaced the coffee and the cocoa powder with strawberry sauce and I decorated with red currant. Where are the egg yolks? Is there a printer friendly version to copy? you can click on the printer button to print just the recipe, or you can click on the share button and choose the print option. 9 by 13 inch pan.